Black valedictorians: the sound of history repeating? Kymberly Wimberly, a 2011 graduate of McGehee Secondary School in Arkansas, is suing her school district and its officials, claiming they violated her constitutional right to equal treatment under the law. 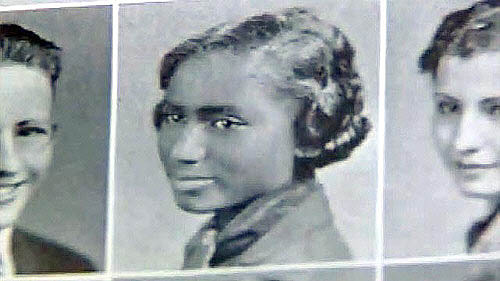 According to the Associated Press, the lawsuit claims that a school counselor told Wimberly’s mother in May that the girl had the school’s highest grade point average in the graduating class, but later the mother, who works at the school, overheard a conversation in which staff said there would be a “big mess” if a black girl stood alone as valedictorian. A white female student was selected to serve as “co-valedictorian,” and both gave speeches at their May 13 graduation. The district’s superintendent, who is black, told an Arkansas television station that “the second girl took more classes and that a school rule prevents extra course work from penalizing students when calculating grade point averages.” After they did the math, the superintendent said, the two students’ GPAs were the same. Sounds like fuzzy math to me, but now it’s in the hands of the court. This tale brings to mind the story of the late Fannetta Nelson Gordon, who in April of this year posthumously received the valedictory recognition she had been denied for 75 years. Both sisters were honored by the high school’s alumni association this spring, and the story made national news. We all felt good that even though Nelson Gordon did not live to receive the recognition, an injustice had been righted. And however the lawsuit turns out, Wimberly has already won. “My teachers thought I’d fall flat on my face, but I kept trying to succeed,” she said. Thank you, Elaine, for another fabulous column. I love reading these. Thank you, as always, Yvonne. I hope all goes well with the writer’s conference.